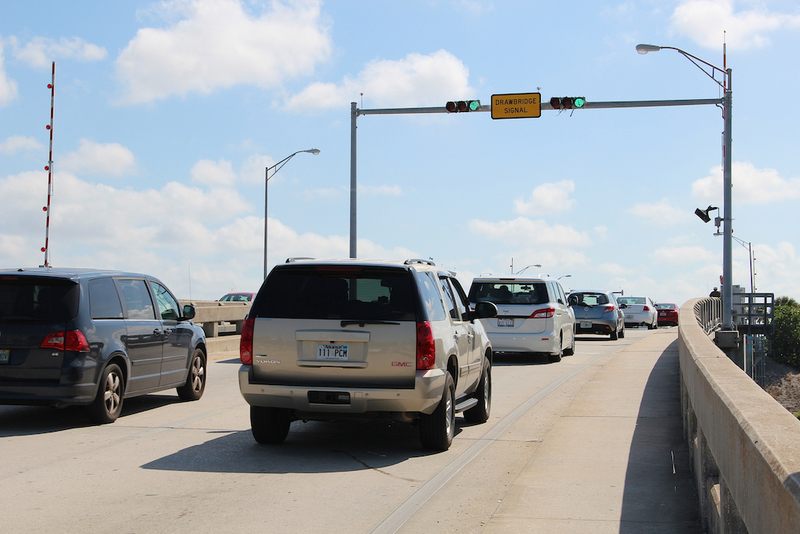 Although Commissioner Charles Hines asked a lot of questions, he ultimately joined three of his colleagues in supporting the inclusion of a $1.1-million Sarasota County Barrier Island Study on an updated list of county transportation funding priorities. 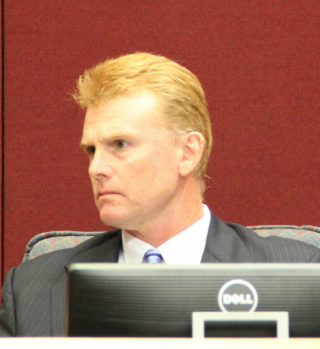 Commissioner Alan Maio was absent during the Feb. 27 discussion and vote because of his representation of the commission at a board meeting of the Southwest Florida Water Management District. The barrier island study was ranked No. 8 on the 2018 list county staff will present to the Sarasota-Manatee Metropolitan Planning Organization (MPO). The MPO board also must vote in favor of the list before the priorities can be submitted to the Florida Department of Transportation (FDOT). The top project for the county remains improvements to River Road because of burgeoning development in South County and the relocation of the Atlanta Braves’ Spring Training operations to a facility underway in the West Villages, outside North Port. The Braves are expected to move into that complex in time to play their final Spring Training game in 2019. 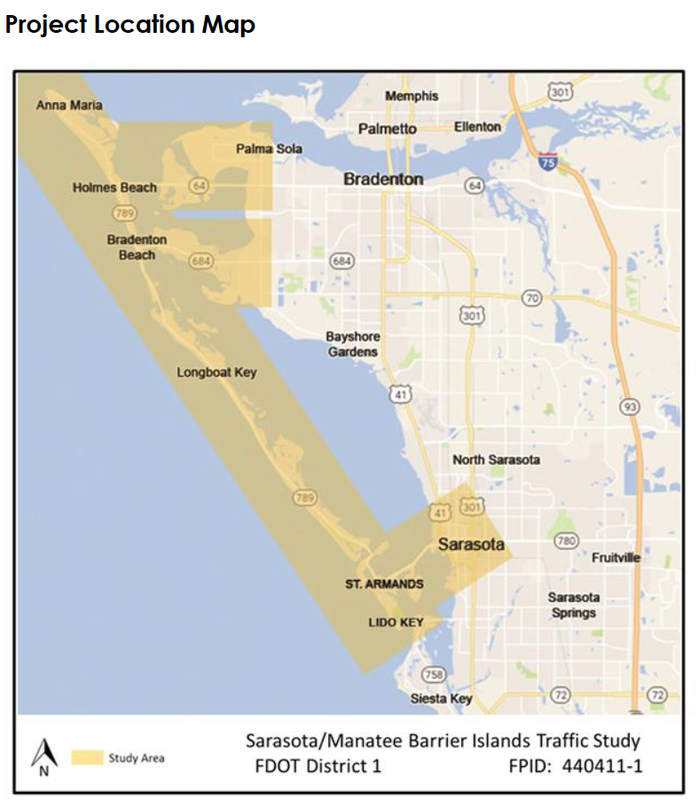 Hines voiced frustration on Feb. 27 over a Barrier Islands Traffic Study FDOT has undertaken for Manatee County, with support of the Town of Longboat Key and the City of Sarasota. Over the past few years, the public has complained in earnest about traffic jams — especially during the height of tourist season — as visitors and residents leave Lido and Longboat keys in late afternoon to head to arts performances and other activities in Sarasota — or to head toward Interstate 75. Wiggins explained that the new study would encompass Siesta, Casey and Manasota keys, along with the rest of the unincorporated areas of the county; it would look for ways to ease traffic congestion, just as the Manatee County study was doing for the northern barrier islands. Among facets of the initiative, she said, plans call for examining the potential use of electronic messaging boards to alert drivers when beach parking lots are full, as “one of the main issues” is people trying to reach the beaches. If motorists had information ahead of time that they would be unable to park at Siesta Public Beach, for example, they could seek off-site parking options and alternative transportation, such as a trolley, Wiggins noted. The study also would provide more information about potential costs to reduce traffic congestion on the islands, Wiggins told Hines. Referring to the estimated $1.1-million expense, Hines said, “I’d rather take that money and build something or fund a trolley,” instead of paying a consultant. In discussions late last year, the commissioners talked of the desire to expand the service of the Siesta Key Breeze open-air trolley that the county launched on Siesta Key in March 2017. If the Breeze could reach parking areas in close proximity to the island, and make pickups and drop-offs quickly enough, Hines pointed out during those talks, then people would be more inclined not to drive to the beach. “I struggle with studies and studies and studies, when you’re a professional,” Hines stressed on Feb. 27 to Wiggins; Spencer Anderson, interim director of the county’s Public Works Department, has professional expertise in traffic planning, as well, Hines said. During the MPO board meeting the previous day, Wiggins explained, Manatee County commissioners pointed to the numerous recommendations coming out of the Barrier Islands Study FDOT undertook for them. Short-term and mid-term options are included among those, she noted, indicating that implementation should lead to a reduction in congestion. Hines then pointed out, “Our staff three years ago wanted to delay the [construction of the diverging diamond interchange at University Parkway and Interstate 75].” When he and other community leaders met with the FDOT secretary in Tallahassee to push for the project, Hines continued, they told the secretary no more studies were needed. They also asked county staff “to stop talking,” he continued. “Our staff got angry with us,” but the secretary agreed to make the diverging diamond a priority, Hines said, and it has won accolades for how it is functioning to reduce congestion. “I hate hiring consultants and paying for studies when you could use the money for bricks and mortar or something more tangible,” Chair Nancy Detert added. However, if undertaking the study would enable the county “to leverage state and federal funds,” she said, she could see value in it. The Manatee County commissioners are “really happy” about their study, Detert pointed out. “I agree with the premise that … we all know that probably our most significant thing that can happen to mitigate the traffic is likely not going to happen: the construction of a third bridge,” Commissioner Paul Caragiulo said. Then Leigh Holt, planning manager for the MPO, emphasized Wiggins’ earlier comment about the number of recommendations coming out of the Manatee County study. Some of the solutions had not been considered previously, she noted. For example, the addition of an optional third left-turn lane from Gulfstream Avenue onto northbound U.S. 41 in downtown Sarasota was shown to ease traffic backups from Lido and Longboat keys, she said. 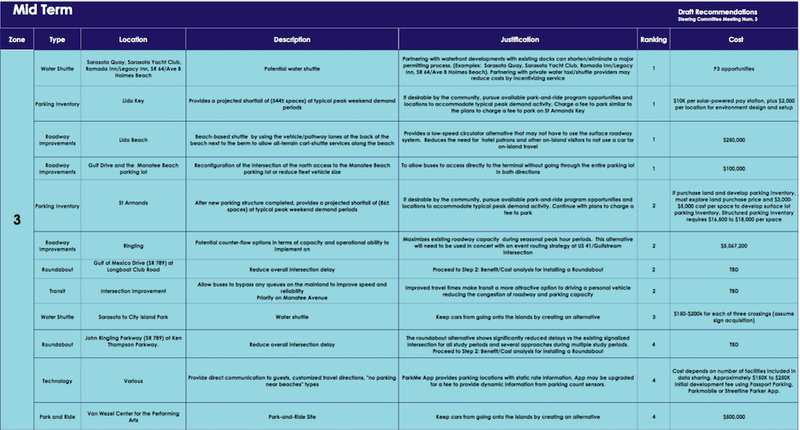 Altogether, Holt noted, the Barrier Islands Study has about 200 recommendations. Yet another recommendation for a high priority on the county’s 2018 list is a new I-75 interchange at State Road 681. “Can you tell me why [that] suddenly popped up to No. 4?” Chair Detert asked Wiggins. “We have a significant amount of development that is coming online in the central county area,” Wiggins responded. More housing is planned on Palmer Ranch, for example, she said, and on the former Hi Hat Ranch property. The State Road 681 interchange is the only one between Clark Road and Laurel Road that does not have a southbound entrance, Wiggins continued. 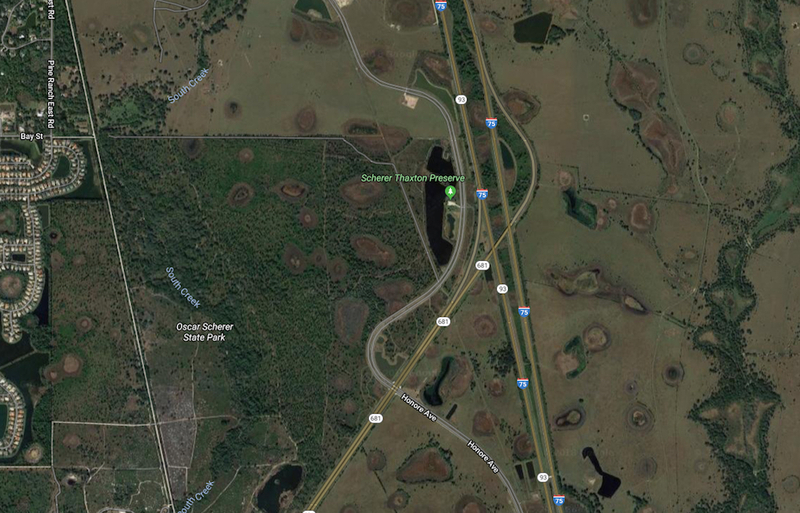 Even if FDOT agreed to include the interchange project in its work program, Detert said, the project would not begin for years. Later than 2024? Detert asked. Nonetheless, Detert agreed to support keeping the project on the list.